A beetle (Himalusa thailandensis) that could be used to control the invasive Skunk Vine (Paederia foetida) has been identified by Agricultural Research Service (ARS) scientists and cooperators. 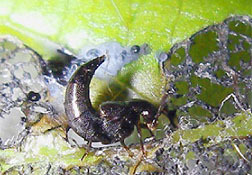 The adult beetles feed near the leaf mid-vein of the plant, they also scrape nearby leaf tissues from this refuge, which blacken and decay, producing significant levels of foliar damage. The larvae burrow into and feed within the leaf stalks. As they grow, the stalks swell until they split and the larvae drop out to pupate in the soil. Preliminary results show that the beetle is specific to Skunk Vines. There are no native species of skunk vine in the United States, so H. thailandensis could be a promising biocontrol for this invasive weed.